The Twenty-Eight Parrots, also known as Yellow-collared Parrots, (Barnardius zonarius semitorquatus) is found in south-west West Australia. Its calls sound like the words "‘twenty eight," which explains their name. 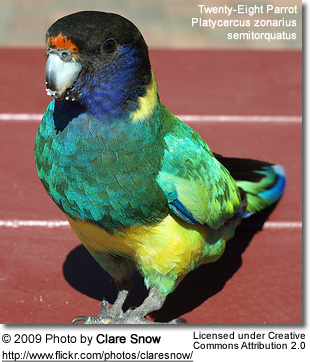 This parrot belongs to the genus barnardius, along with the Mallee Ringneck, Port Lincoln Parrot, and Cloncurry Parrot. These parrots all have a green body and a yellow ring or collar around their necks and are referred to as Australian Ringnecks. These parrots are 15.75 ins (40 cm) long. They have a black head, with a red forehead, and their abdomen are a dull green. To the right, you see the beautiful blue mutation as well. The females have a paler plumage; head more brownish; red band to forehead narrower; latter absent in some birds. 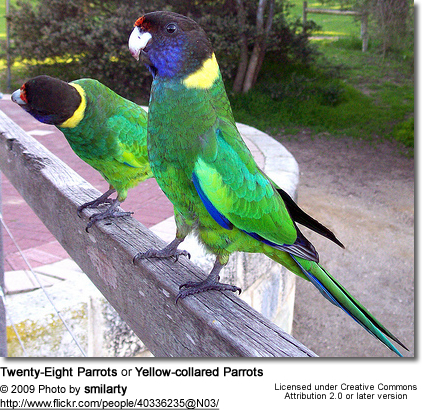 The Twenty-eight and Port Lincoln parrots and the wheatbelt hybrid are all very similar in coloration and are easily confused. They are not beginner birds. An intermediate to advanced knowledge of parrot breeding is recommended. They can be aggressive towards other birds, and it's best to house them one pair per aviary. The minimum aviary size should be about 10 feet (3 meters) in length and 3 to 3.5 feet (about one meter) wide. Double wiring between each aviary flight is necessary. Non-toxic leafy branches can be placed in the aviary for the birds to chew up. This will entertain the birds and give the birds some beak exercise. Natural branches of various diameters, and placed at various angles, make great perches. They require a quality parrot seed mix along with a variety of fruits, green leafy vegetables and vegetables. Seeding grasses and green can be offered. Soaked or sprouted seeds, if available. Dimensions can vary widely, influenced by the bird's and the owner's preferences. Parent bird's preferences can be influenced by the size and type of nest-box / log in which they have been raised. Offering a choice of sizes and types of logs or nest-boxes, and placed in various locations within the aviary, will allow the parent birds to make their own choice. Once a pair has chosen a specific nest-box/log and been successful in it, offer that one to them each breeding season. Once a pair has chosen its log or nest-box, the other ones can generally be removed. All Australian parrots will breed in hollow logs. Sturdy logs are recommended. The length of a nest box / log should approximate 24 inches. A log's internal diameter about 6-5 to 8 inches; and the internal diameters of a nest box about 7 inches square. The inspection hole should be around 4 inches (square or round). A removable top / lid is recommended for easy inspections and for cleaning. The best location for the nest box / log is high in the covered part of the aviary, but not too close to the roof to be affected by heat from the roof in the summer months. They generally produce one clutch per year, with about 4 eggs each clutch. The female incubates the eggs for about 20 to 21 days. The young stay in the next box for about 5 weeks and are independent within another 2 to 3 weeks. Young should be removed from the parent birds after they have become fully independent to avoid possible aggression from a parent bird and to allow the adult pair to possibly start another clutch. Please visit this webpage for more detailed information on breeding.